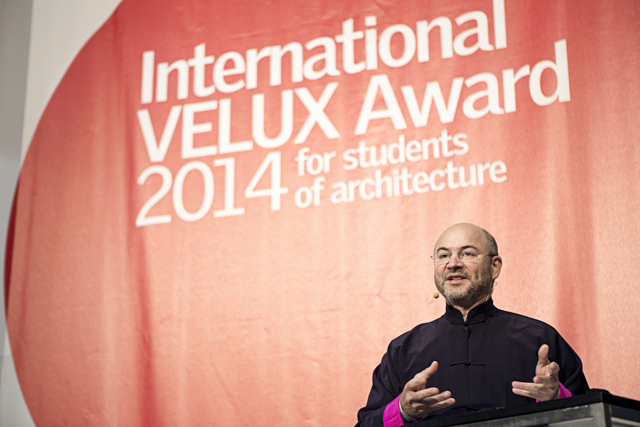 The world-famous architect Craig Dykers was a member of the jury of the International VELUX Award, when the Award first took place in 2004. Craig Dykers was also part of the jury in 2014, this time as chairman of the jury. At the Award event in Vienna he provided the winnings students and the invited guests with food for thought in a lecture on the meaning of light and darkness for people’s lives and as a fundamental element of architecture. “Right from the very beginning when we are born, the perception of light and darkness is part of our lives and our understanding of the world, so basic that we often forget to think about the importance of light and dark and just take it for granted. Light and darkness run in our genes and determine our mental and physical health and the life quality of people. Our ancestors had an intuitive understanding of this and had to adopt their lives to light and darkness, but in modern society we tend to forget the importance of light and darkness, said Craig Dykers in his lecture. He put the human perception of light and darkness into perspective when he invited the audience to visit the moon. When he was a boy his parents took him to a dinner party where he met one of the American astronauts who had been to the moon, and from the astronaut he got a firsthand impression of light and darkness on the moon. How the sky on the sunny side of the moon is always pitch-black without stars. How dust make it impossible to distinguish colours on the moon. And how millions of dust particles, small glass crystals, are kicked up when you walk on the surface on the moon so that you actually create your own daylight when the rays from the sun shine through the crystals. This meeting with the astronaut stirred the dreams of the young boy, a budding curiosity of light and darkness, and later inspired his work with architecture. The interaction between light/darkness and human beings – consciously and subconsciously – has become one of the defining features of his architectural practice, Snøhetta, recognized for world famous projects like the Alexandria Library in Egypt, the Norwegian National Opera in Oslo and the National September 11 Memorial Museum Pavilion at the World Trade Center opened in April 2014. Hi´s and Snøhetta´s main concern is the use of design as a promoter of social and physical well-being – supported by ongoing observation and development of an innovative design process. Craig Dykers took the audience on a tour of Snøhetta’s projects with a special focus on how his team works with daylight and its opposite, shadow and darkness, in their design, – in the selection of materials and in the layout of the buildings. From the Alexandria Library in Cairo, a cultural meeting place, where blue and green glass in the roof, make reflections on the floors as the sun passes overhead, inspiring people to take a break from what they are doing. To a brand new Student Learning Centre in Ontario, Canada, currently under construction, where an origami-inspired, transparent glass skin will provide varying light qualities within the interior spaces, while providing a beautiful view to people passing by outside the building. Memorial Museum Pavilion standing on its toe med billedtekst: In the early morning when the sun rises over the Atlantic Ocean there is a special moment at the National September 11 Memorial Museum Pavilion when the building stands on its toe. From Times Square reconstruction: The layout of the streets of Manhatten takes directions from the sun, and at certain magical moments the sun shines directly onto some of the main streets. Snøhetta uses the special moments of sunlight as part of their reconstruction of Times Square in New York.